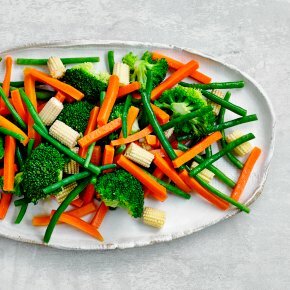 A prepared mix of carrot batons, trimmed green beans, broccoli and babycorn. Washed and ready to cook. INGREDIENTS: Carrot, broccoli, green bean, babycorn. Time: 6 minutes. Remove from packaging. Place in a pan of boiling water. Cover and bring back to the boil. Reduce heat and simmer for 6 minutes or until tender. Time: 12 minutes. Remove all packaging. Place in a steamer and steam until tender.